Carrie Cowell was born circa 1875 at Wisconsin. She was the daughter of Daniel Cowell and Minerva (?). [S246] U.S. Federal Census 1880 U.S. Federal Census, by Ancestry.com, NA Film Number T9-1429 Page Number 201C. Fanny Cowell was born circa 1877 at Wisconsin. Willie Vail was born circa 1872 at Wisconsin. He was the son of (?) Vail and Minerva (?). Willie Cowell was born circa 1872 at Wisconsin. He was the son of Daniel Cowell and Rhoda (?). Name Variation Amity Louise Stryker was also known as Amita. Married Name 1890 As of 1890,her married name was Bowell. Amity Louise Stryker was born on 21 November 1875 at Iowa, Wisconsin. Amity Louise Stryker married George Edwin Bowell, son of Isaac Bowell and Rosalinda Tew, in 1890 George and Amity were 1st cousins once removed. Amity Louise Stryker died on 20 November 1962 at Richland Center, Richland, Wisconsin, at age 86 Amity (Stryker) Bowell obituary. Amity Louise Stryker had 5 with 5 living in 1900 children. She had 9 with 9 living in 1910 children. [S245] U.S. Federal Census 1900 U.S. Federal Census, by Ancestry.com, ED110. Dwelling 156. [S244] U.S. Federal Census 1910 U.S. Federal Census, by Ancestry.com, ED94. Dwelling 98. Married Name Her married name was Goedecke. Grace Alinda Bowell was born on 14 March 1892 at Wisconsin. Grace Alinda Bowell died on 14 October 1956 at age 64. Hazel P. Bowell was born in September 1893 at Wisconsin. Hazel P. Bowell died in 1911. Bessie L. Bowell was born in October 1894 at Wisconsin also reported as 1895. Bessie L. Bowell died in 1968. Married Name 18 April 1917 As of 18 April 1917,her married name was Jackett. Married Name between 1937 and 1962 As of between 1937 and 1962,her married name was Batchelor. Lillian Isabel Bowell was born on 31 March 1898 at Richland, Wisconsin. Lillian Isabel Bowell married Stephen Edward Jackett, son of John Jackett and Matilda Larkin, on 18 April 1917 at Bear Creek, Sauk, Wisconsin. Lillian Isabel Bowell died in February 1970 at age 71. Lillian Isabel Bowell obtained US Social Security Card at Wisconsin; last residence Mineral Point, Iowa, Wisconsin. George Bowell Jr. was born on 13 May 1900 at Wisconsin. George Bowell Jr. died in November 1969 at age 69. George Bowell Jr. obtained US Social Security Card at Wisconsin; last residence Richland Center, Richland, Wisconsin. Name Variation Roland E. Bowell was also known as Rollin. Roland E. Bowell was born on 2 September 1902 at Richland, Wisconsin. Roland E. Bowell married Christine G. Scholl, daughter of Erik Scholl and Emma (? ), circa 1929 at first marriage for her. 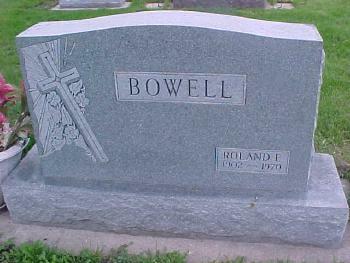 Roland E. Bowell died on 17 July 1970 at age 67. He was buried after 17 July 1970 at Big Hollow Lutheran Cemetery, Bear Creek, Sauk, Wisconsin. Roland E. Bowell obtained US Social Security Card at Wisconsin; last residence Spring Green, Sauk, Wisconsin. [S250] U.S. Federal Census 1930 U.S. Federal Census, by Ancestry.com, ED8. Dwelling 16. Leslie J. Bowell was born on 27 June 1904 at Wisconsin. Leslie J. Bowell died in November 1970 at age 66. Leslie J. Bowell obtained US Social Security Card at Wisconsin; last residence Richland Center, Richland, Wisconsin. Harry E. Bowell was born on 14 January 1907 at Wisconsin. Harry E. Bowell died in November 1980 at age 73. Harry E. Bowell obtained US Social Security Card at Wisconsin; last residence Viola, Vernon, Wisconsin. Donald S. Bowell was born in 1909 at Wisconsin. Donald S. Bowell died in 1936. Name Variation Lila Bowell was also known as Abby. Lila Bowell was born on 7 May 1854 at Pennsylvania. She was the daughter of Isaac Bowell and Rosalinda Tew. Lila Bowell died on 19 January 1865 at Wisconsin at age 10. 20 June 1860 Dodgeville, Iowa, Wisconsin Lila Bowell was listed in Isaac Bowell's household on the 1860 Census at Dodgeville, Iowa, Wisconsin. Married Name Her married name was Butcher. Sarah A. Bowell married Ben Butcher. Sarah A. Bowell was born on 18 July 1857 at Clyde, Iowa, Wisconsin, twin with Elizabeth. Sarah A. Bowell died on 24 September 1941 at Evansville, Rock, Wisconsin, at age 84. 20 June 1860 Dodgeville, Iowa, Wisconsin Sarah A. Bowell was listed in Isaac Bowell's household on the 1860 Census at Dodgeville, Iowa, Wisconsin. Married Name 25 October 1874 As of 25 October 1874,her married name was Sturdevant. Elizabeth Jane Bowell was born on 18 July 1857 at Clyde, Iowa, Wisconsin, twin with Sarah. Elizabeth Jane Bowell married Calvin Sturdevant on 25 October 1874. Elizabeth Jane Bowell died on 13 March 1937 at Evansville, Rock, Wisconsin, at age 79 Elizabeth (Bowell) Sturdevant obituary. 20 June 1860 Dodgeville, Iowa, Wisconsin Elizabeth Jane Bowell was listed in Isaac Bowell's household on the 1860 Census at Dodgeville, Iowa, Wisconsin. James Tew was born in 1812 at England christened 1 March 1812 in Barford, St. John, Oxfordshire, England. He married Alice Parish on 11 July 1830 at Adderbury, Oxfordshire, England. Thomas Bowell married Mary Tanner. Thomas Bowell was born circa 1785 at England. Married Name Her married name was Bowell. Mary Tanner married Thomas Bowell. Mary Tanner was born circa 1787. Welcome A. Hoxie was born on 7 October 1831 at Rhode Island. He was the son of Arnold Hoxie and Hannah (?). Welcome A. Hoxie married Rosalinda Tew, daughter of James Tew and Alice Parish, on 2 April 1866 at her second marriage, Clyde, Iowa, Wisconsin. Welcome A. Hoxie died on 20 January 1886 at age 54. [S249] U.S. Federal Census 1850 U.S. Federal Census, by Ancestry.com, Dwelling 611. Married Name Her married name was Whitlock. Married Name 11 July 1830 As of 11 July 1830,her married name was Tew. Alice Parish married William Whitlock at her first marriage. Alice Parish was born in 1794 at England christened 2 Mar 1794 in Barford, St. John, Oxfordshire England. She married James Tew on 11 July 1830 at Adderbury, Oxfordshire, England. Name Variation Isabell Maria Tew was also known as Isabella. Married Name 28 January 1853 As of 28 January 1853,her married name was Gile. Isabell Maria Tew was born on 13 January 1832 at Barford, St. John, Oxfordshire, England. Isabell Maria Tew married Benjamin Gile on 28 January 1853 at Suquehanna, Pennsylvania. Isabell Maria Tew died on 9 May 1918 at Clyde, Iowa, Wisconsin, at age 86. Benjamin Gile was born on 8 November 1831 at Connecticut. He married Isabell Maria Tew, daughter of James Tew and Alice Parish, on 28 January 1853 at Suquehanna, Pennsylvania. Benjamin Gile died on 2 July 1918 at Lone Rock, Richland, Wisconsin, at age 86. Seba Bowell was born in 1810 at Swerford, Oxfordshire, England. Hannah Bowell was born in 1812. She was the daughter of Thomas Bowell and Mary Tanner. George Bowell died in 1815. He was born in 1815. Edwin Bowell was born in 1816. Thomas Bowell was born in 1818. Dinah Bowell was born in 1820.